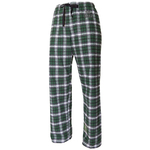 Badger ladies short features moisture management, antimicrobial performance fabric, piped side panel and hem, 3" inseam, and 1 1/2" inside exposed elastic waistband and drawcord. Badger's men fusion shorts feature moisture management and antimicrobial performance, contrast insert on front and back legs, contrast top stitching, 2" covered elastic waistband with drawcord, and two deep side pockets. Badger Men's Performance shorts feature two deep side seam pockets, heat seal logo on left hip, 2" covered elastic waistband and drawcord, athletic cut, double-needle hem, and 10" inseam. 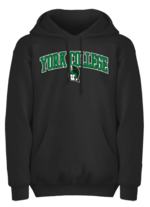 Blue 84 Hooded sweatshirt features ringspun fleece with a lined hood, relaxed fit, and York College, Est. 1787 design in twill on the chest. Our Blue 84 tee comes in a classic fit, with contrast between 3/4 sleeves and the neckline, and stays true to size. Ladies cut V-neck triblend tee offers a soft feel with blind stitching on the hem and sleeves, a ribbed neckband, and has been hand-treated to create a weathered, soft, sheer fabric for a flattering fit. *Ladies fit may fit smaller than normal cut sizing. Our Blue 84 lace up v-neck has contrast twill stripes on the sleeves, and a feminine feel and look. Blue 84 Ladies tri-blend tee is uniquely created with blind stitching on the hem and sleeves, ribbed neckband, and a hand-treatment to create a weathered, soft, sheer fabric. Our Blue 84 men's long sleeve hooded tee has the Spartan head over York over College on the front. Our Blue 84 men's tee has York College over the spartan head over 1787 in the front chest. A fresh, new, York College tee. Our Blue 84 full zip hoodie, come with a Spartans Seal design on the left chest. 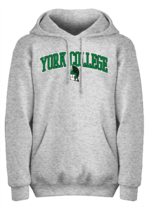 This Blue 84 hoodie, has York College written on the front chest, with 87 in the center, and Spartans underneath. Boxercraft ladies* caged front v-neck tee features miltered V-neck, crisscross front neckline detail, contoured waistline for a feminine fit, and double-needle sleeve and shirttail hem. *Ladies/junior fit. May need to go up in size for best fit. Contrast color body, sleeve stripes, and neckline, V-neck design. Boxercraft ladies* sherpa vest jacket is perfect for those cold winter days. It offers a cozy fur-like feel and with an ultra-soft interior and exterior, it feels like being snuggled up in a blanket all throughout the day. It features self-fabric collar dyed to match stitching, half-moon back yoke, and twill tape inside neck trim.